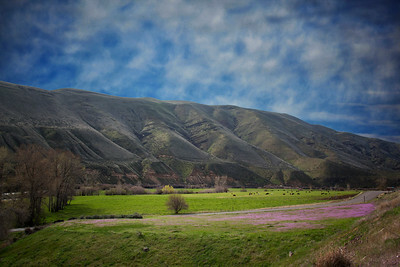 This is a Monet inspired impressionistic digital art interpretation of a photo taken on 2/26/18 along Hwy 12 near Wallula Junction, WA. 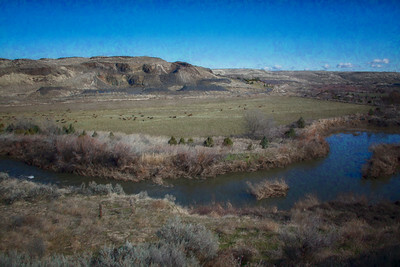 The Walla Walla River is shown with cattle in the pasture, sagebrush in the foreground, and desert in the background. This photo was taken on 2/26/18 along Hwy 12 near Wallula Junction, WA. The Walla Walla River is shown with cattle in the pasture, sagebrush in the foreground, and desert in the background. This is a Monet inspired version of the original photo. 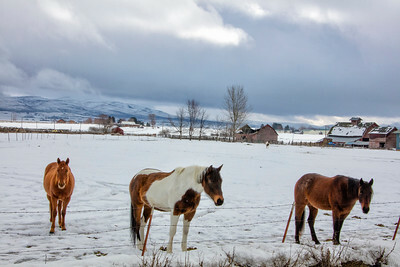 This photo depicts a quartet of Brown Mules, used in the rodeo to pull wagons. 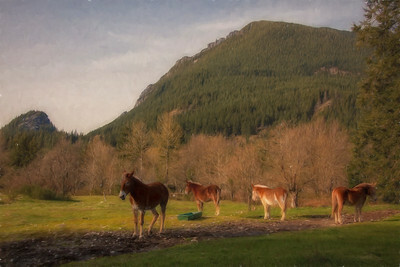 They are in a pasture along North Bend Way in North Bend, Washington. Mount Si is looming in the background, with Little Si sticking up like a thumb in the far left background. 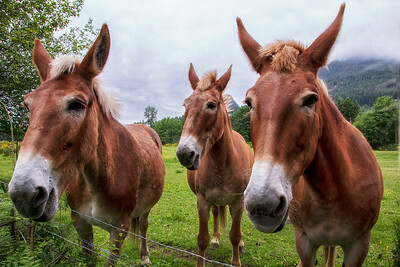 This photo depicts a quartet of Brown Mules, used in the rodeo to pull wagons. 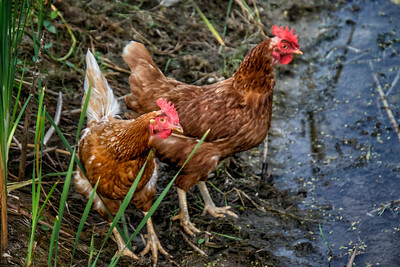 They are in a pasture along North Bend Way in North Bend, Washington. Mount Si is looming in the background, with Little Si sticking up like a thumb in the far left background. 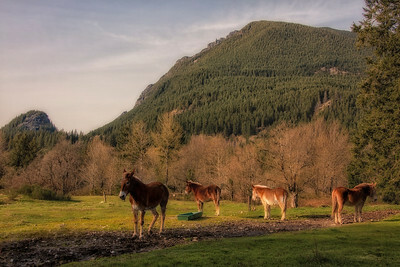 This photo from September 2015 shows the Anderson Brown Mules in a pasture along North Bend Way in North Bend Washington. This photo shows the back side of Mount Si and Mt Teneriffe in the distant right background. 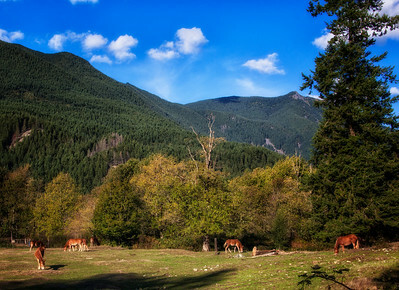 This photo from September 2015 shows the Anderson Brown Mules in a pasture along North Bend Way in North Bend Washington. 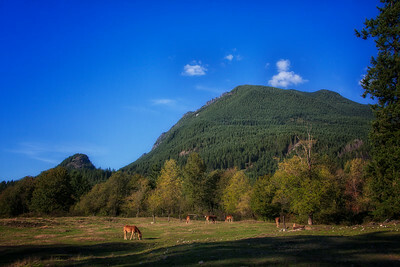 This photo shows the back side of Mount Si and Little Si sticking up like a thumb in the left background. 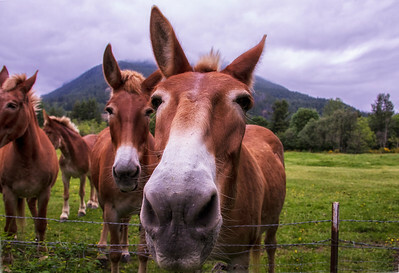 The famous Anderson brown mules that perform in various rodeos and shows in their home pasture on a spring day 5/7/18 along North Bend Way in North Bend Washington. The back side of Mt Si is visible in the background as is Little Si, the small thumb sticking up on the left. This photo was taken the evening of May 22, 2018 near North Bend Washington. 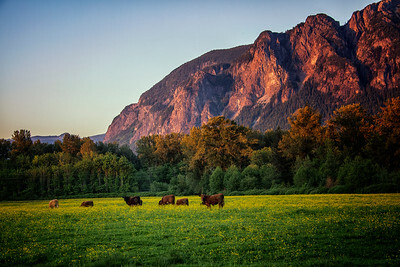 It shows cattle grazing in a pasture of blooming buttercups during the golden hour before sunset with Mount Si glowing in the evening's last gloaming light of day. 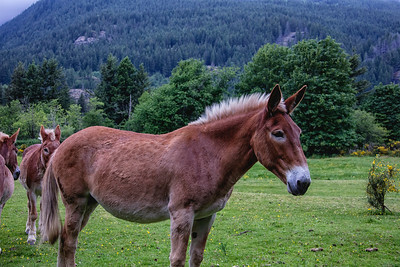 Anderson Mules 2 North Bend WA Dawn 5-25-18. This photo taken around dawn on 5/25/18 shows 3 of the Anderson Brown Mules in their pasture near North Bend Washington. Scotch Broom is blooming in the background on this spring morning. The backside of Mount Si is in the background. Anderson Mules 1 North Bend WA Dawn 5-25-18. This photo taken around dawn on 5/25/18 shows 3 of the Anderson Brown Mules in their pasture near North Bend Washington. Scotch Broom is blooming in the background on this spring morning. The backside of Mount Si is in the background. 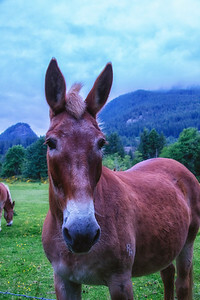 Anderson Mules 4 North Bend WA Dawn 5-25-18. This photo taken around dawn on 5/25/18 shows 3 of the Anderson Brown Mules in their pasture near North Bend Washington. Scotch Broom is blooming in the background on this spring morning. The backside of Mount Si is in the background. Anderson Mules 3 North Bend WA Dawn 5-25-18. This photo taken around dawn on 5/25/18 shows 3 of the Anderson Brown Mules in their pasture near North Bend Washington. Scotch Broom is blooming in the background on this spring morning. The backside of Mount Si is in the background. 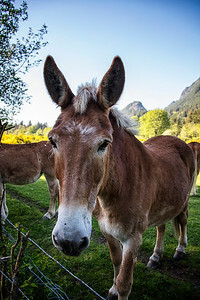 Anderson Mules 6 North Bend WA Portrait Dawn 5-25-18. 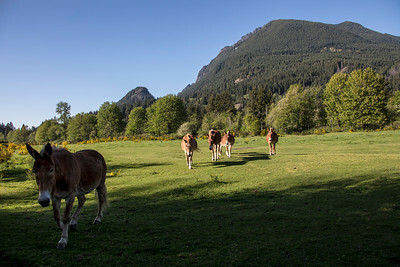 This photo taken around dawn on 5/25/18 shows 3 of the Anderson Brown Mules in their pasture near North Bend Washington. Scotch Broom is blooming in the background on this spring morning. The backside of Mount Si is in the background. 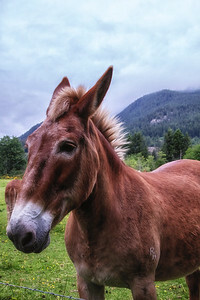 Anderson Mules 5 North Bend WA Portrait Dawn 5-25-18. 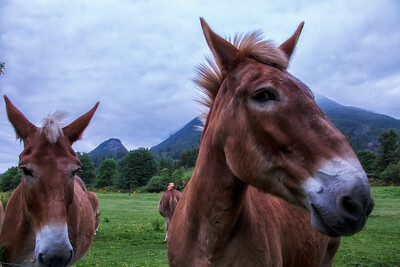 This photo taken around dawn on 5/25/18 shows 3 of the Anderson Brown Mules in their pasture near North Bend Washington. Scotch Broom is blooming in the background on this spring morning. The backside of Mount Si is in the background as well as Little Si - the hump sticking up like a thumb in the left background. 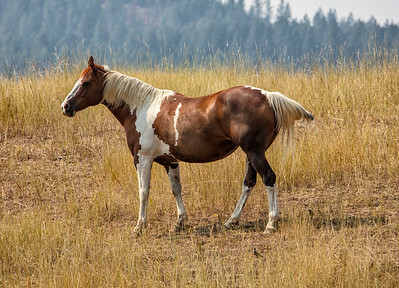 Anderson Mules 7 North Bend WA Dawn 5-25-18. 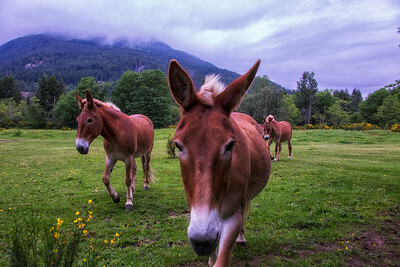 This photo taken around dawn on 5/25/18 shows 3 of the Anderson Brown Mules in their pasture near North Bend Washington. Scotch Broom is blooming in the background on this spring morning. The backside of Mount Si is in the background. 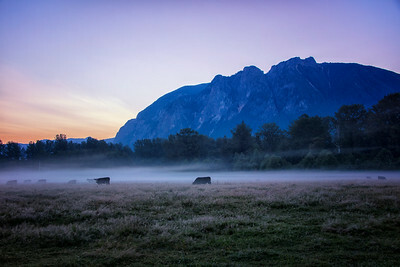 Mt Si Sunrise Cattle in Summer Mist 7-27-18 in a pasture near North Bend Washington.